Deal 3 damage to a minion and the enemy hero. 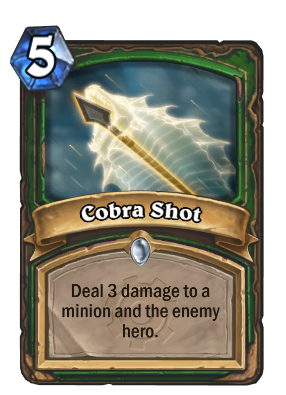 "Cobra Shot" hurts way, way, way more than "Cobra Cuddle." This card is a bad 4 drop , but is 5 mana. Enough said. I do belive it would be fairly good at 4 mana. 3 damage to a minion is worth 2 mana. 3 damage to the face in hunter for 2 is about as good. And when you get it togeather in one card? Why shouldn't it be good? "I got a good idea! Let's take a Darkbomb and a Sinister Strike and put them together in 1 card!" This can bypass a taunt and with your hero power which also bypasses taunt you can get 5 in and often finish up your opponent especially because he isn't expecting to take so much damage. If this was buffed to a 4 mana cost, it could be viable. As a card in isolation, this should have cost 3.5 mana, going either way. But since Hunter is powerful, it's understandable that during development, the mana cost must have been changed. At least this card won't be lonely, it'll have plenty of others to keep it company in the trash bin. I believe that Blizzard doesn't want to give any more tools for aggro zoo. That explains the cost of this card. They ended up doing something that works poorly for both control and agro.